Excerpt from "The Writing of 'The Enemy Within' "
Richard Matheson’s story outline, ST #14: April 4, 1966. Matheson’s revised story outline, gratis: April 22, 1966. Matheson’s 1st Draft teleplay: April 25, 1966. Matheson’s gratis rewrite (Revised 1st Draft teleplay): May 19, 1966. Matheson’s 2nd Draft teleplay: May 31, 1966. John D.F. Black’s script polish (Mimeo Department “Yellow Cover 1st Draft”): June 6, 1966. Gene Roddenberry’s rewrite (Final Draft teleplay): June 8, 1966. Additional page revisions by Roddenberry: June 11 & 15, 1966. A script penned by Richard Matheson gave Roddenberry bragging rights among the science fiction community. Matheson had frequently written for The Twilight Zone, including “Nightmare at 20,000 Feet,” starring William Shatner. On the big screen, Matheson wrote The Incredible Shrinking Man -- based on his own book -- and The Last Man on Earth, a screen adaption of his sci-fi horror novel I Am Legend. He also adapted Jules Verne to the big screen, in the space opera Master of the World, as well as the short stories and poems of Edgar Allan Poe for filmmaker Roger Corman, including House of Usher, Tales of Terror, The Pit and the Pendulum and The Raven. In years to come, Matheson would write the screenplays for The Night Stalker, Somewhere in Time -- and Steven Spielberg’s cult TV hit, Duel. Matheson’s introduction to Star Trek came with an invitation from Roddenberry and Desilu to attend one of the studio screenings of “Where No Man Has Gone Before.” He dropped in for the second of these, on March 8. In the room with him were future Star Trek writers George Clayton Johnson (“The Man Trap”), Paul Schneider (“Balance of Terror” and “The Squire of Gothos”), Oliver Crawford (“The Galileo Seven” and “Let That Be Your Last Battlefield”), John Kneubuhl (“Bread and Circuses”), and Meyer Dolinsky (“Plato’s Stepchildren”). 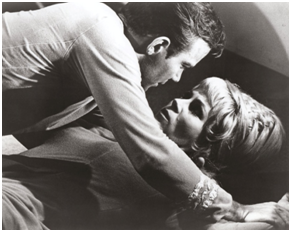 The scene was rendered all the more brutal by Matheson’s description of Kirk’s alter ego. As the “Evil Kirk” wanders the ship, he doesn’t just swill Saurian brandy, he gets downright drunk. He is more barbaric, more reckless and far less cunning than what was ultimately depicted on screen. Attacking and beating a human being, which Kirk’s bad side certainly does, was not enough. A grizzly bear will do that out of instinct. But molestation goes beyond mere survival. It is calculated, even perversely hedonistic. It is the dark side of humanity. The encouraging word was a moot point. Roddenberry, desperate for scripts and not wanting to alienate someone of Richard Matheson’s status, had already given the go-ahead for him to write his teleplay -- even before hearing from NBC regarding the concept. Matheson’s first draft script hit Roddenberry’s desk on April 25. New to the story now, at Roddenberry’s insistence, was the subplot dealing with the men left behind on the planet. The leader of those men was not Sulu but a crewman named North. Matheson reluctantly added in the B-story, taking care not to let it dominate the tale – one he believed had enough drama in it already. 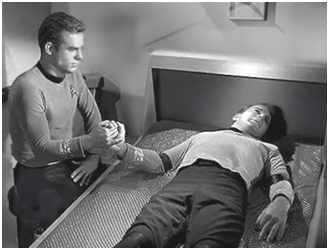 With all of Kirk’s inner angst, creating an outside problem for him to deal with felt artificial to Matheson. Roddenberry disagreed, believing that the men stranded on the planet not only put pressure on Kirk and created an urgency for him to resolve his problems, but tested the Captain, better illustrating the point Matheson wanted to make about the human quality required to make a command decision. Roddenberry also suggested that Kirk not allow himself the prerogative of letting the crew in on his dilemma. He knew from his own experience in the military that in order to lead a leader can never be seen as weak in the eyes of his subordinates. This would be one more weight on the strained shoulders of the tormented Captain. These suggestions and more infused the story and character elements with the concepts and themes that elevate “The Enemy Within” to classic status. It was no longer just an outer space version of Dr. Jekyll and Mr. Hyde. Of course The Twilight Zone was an anthology series with no recurring characters or sets, an entirely different kettle of fish. Except that this particular “first” draft was Matheson’s second. Beyond the issues of screen credits and residuals, the magnitude of the work being done by the freelance writers on Star Trek was out of proportion to the money paid. The volume of the workload expected at Star Trek was unprecedented, with writers often receiving dozens of pages of notes from the producer on each and every draft, requiring more than mere script polishing but complete overhauling of their teleplays. What would be two weeks’ work on most other shows almost always became -- for the same money -- a full month’s work on Star Trek. This obsessive rewriting helped to make a TV classic but left in its wake many bruised egos, aborted writing assignments and irreparably damaged producer/writer relationships. Black rolled up his sleeves and did a script polish. He was careful to confine his changes to those that pertained to character traits of the series regulars and the workings of the Enterprise. He did not want to lose Richard Matheson’s distinctive voice -- that certain something that stamped this work as coming from a science fiction master. Roddenberry did a rewrite of his own two days later, creating the June 8 Final Draft. Among the changes, he replaced crewman North with helmsman Sulu as ranking officer among the men left behind, and put more emphasis on this B-story and more personal anguish onto the “good Kirk” over his inability to find a way to save his landing team. It was this draft that was the first to be sent to the network and be distributed to cast and crew. Time would prove Nimoy wrong; the fans of Star Trek came to love the Spock/McCoy feud. For this story, in particular, the “bickering” helps to visualize much of Kirk’s growing inner conflict. However, the character conflict in this draft of the script needed -- and would receive - some refinement. Robertson recommended that the episode be pushed back on the NBC broadcast schedule so as to not alienate audience members tuning in for the first time.Roddenberry made additional script changes, with revised pages coming in on June 11 and, even after production began, on June 15. It was Roddenberry who added the tidy conclusion to the confrontation on the bridge, with evil Kirk falling apart and seeking the embrace of the good Kirk. 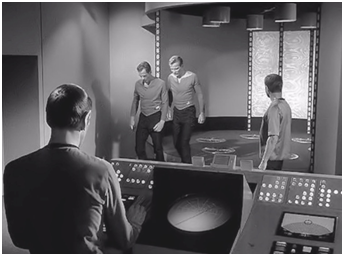 (In Matheson’s script, Kirk had knocked his evil self out with a phaser set on stun.) Despite the screen credit (acknowledging only Matheson as the writer), the script was now a collaborative endeavor.